The decision to make Naples the capital of a vicerealm came about as part of the plans of the Emperor Ferdinand ("the Catholic") of Spain to organise and consolidate his newly conquered domains. To this end, a number of cities were recognised as capitals and conceded certain privileges. Conferring this status on Naples meant that the city was able to maintain a degree of autonomy and continue to feel itself a capital, if now only of a vicerealm. This period as a viceroyalty was to continue for two centuries and saw almost forty five different viceroys assume power. Many of these were conspicuous only for their ineptitude or their ability to grow wealthy at the expense of their subjects; nevertheless, in the first century of the viceroyalty, a handful stood out either for their excessive honesty, or, more usually, for their attempts to establish order and justice in the city and the southern regions. Attempts to impose law and order were no simple matter in a century marked by pestilence and privation, high taxation, widespread banditry, Turkish piracy, political strife with France and the Popes, the Inquisition and a disgruntled baronial class. The first decades of the viceroyalty were particularly marked by disorder, especially of a legal nature, although, unusually for the south, it has been suggested that there was a degree of unity between the barons and the nobles. The first viceroys proved unable or unwilling to tackle the social and legal problems and, so, one can imagine how difficult life had become in Naples especially after the city had been twice hit by pestilence in 1529 and 1530. It was not until 1532 that the city finally received, in the form of Don Pedro Alvarez de Toledo (image, above), a viceroy willing to tackle both the judicial, economic and physical problems of the area. During his long reign (1532-53), Toledo set about the re-organization of his territory in an authoritarian, determined manner which, whilst giving results, was destined to make him enemies amongst the barons. Toledo, in fact, gave little space to the caprices of this class and was at pains to keep them in their place through control of their building rights and a weakening of their role as dispensers of justice and injustice. The enemies he made among this class tried more than once to have Toledo removed but Charles V visited Naples in 1536, was impressed and refused to remove Toledo. Toledo was, therefore, free to continue with his plans for reform and urban reconstruction. 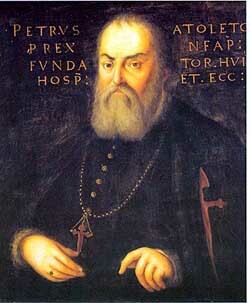 In administrative terms, other than admonishing unruly barons and citizens, he gave little account to the traditions of Naples and even went so far as to close down many of the cultural academies that had flourished in the Aragonese period, especially those suspected of unacceptable religious views. This viceroy also showed a particular interest in the urban problems of the city, many parts of which were in disrepair when he came to power. Once having established his authority, he was able to set to work on the city plan and rebuilding its walls. 1533 saw the beginning of construction of a new palace which was to serve as royal residence in case of a visit by his King and Queen. Building had to be paid for through taxation, and this proved a heavy burden on the population. This fact, plus the continued insufference of the viceroy, led to a series of disorganised revolts culminating in a serious uprising in 1547. Though quelled, the dissension remained and a Neapolitan delegation prayed Charles V to intervene. Charles sent Toledo to quash a rebellion in Sienna, a mission that remained incomplete as Toledo died en route, in Florence. Another viceroy, Ferdinand Alvarez de Toledo, Duke of Alba, had the distinction of warring against the Pope, ostensibly for an offense against the Spaniards resident in the Papal States. Under the menace of excommunication, Philip II of Spain sent the viceroy into the Papal Territories, an order carried out with a 12-thousand-strong army. Having shown their military prowess, the Spanish showed themselves equally willing to sit down and negotiate with Pope Paul IV, and having obtained his promise not to ally with the French and a reconfirmation of Philip's investiture as ruler of the Kingdom of the Two Sicilies, the Spanish swore obedience to the Pope and withdrew their troops. The rule of Don Pedro Afan de Riviera, Duke of Alcalà, coincided with a sad period in Neapolitan history: an over-crowded city suffering from famine, epidemics and three earthquakes. The viceroy made little attempt to help this drastic state of affairs, preferring to add fuel to the fire by persecuting heretics and attempting to introduce the Inquisition in Naples, something which his predessessores had opposed. In 1564, the stakes of the Inquisition were burning in Piazza Mercato in Naples but in the legal battles which followed the distribution of the heretics' possessions, Don Pedro found the city revolting against him and was forced to take refuge in Castelnuovo. Even after the revolt had subsided, the possessions of the heretics continued to be confiscated in a manner contrary to the orders of the Pope and, despite promises to keep the Inquisition out of Naples, by 1566 there came again, due to a growing rift between the Church and the viceroyalty, the possibility of its returning to the city. Other than for his religious zeal, the Duke of Alcalà has gone down in history for his struggle to subdue the many brigands who populated his territory and the Turkish pirates who plagued his coasts. The problem of banditry had reached the scale where one brigand known as 'King Morcone' had a veritable army of 1,500 brigands and had been able to inflict serious losses on the Spanish troops sent against him. To aid in his battle against the Turks, Don Pedro ordered the repair and construction of the "Saracen towers" along the coast. This battle against the pirates continued after the death of Don Pedro by the viceroy, Antonio di Granvelle Perrenot, who joined in league with Spain and Venice to form a powerful fleet which, under the command of John of Austria (illegitimate son of Charles V) set out from Naples to give battle to the Turks, and which finally achieved a decisive victory off Lepanto in October 1571. At the close of the first century of the Spanish Viceroyalty comes Count Olivares Enrico di Guzmàn, who continued in the task of battling criminality and trying to contain the demands of the barons. This viceroy managed to carry out a degree of reform and initiated a programme of rebuilding (roads, customs houses, public building, grain deposits) but, unfortunately, fell foul of the city's clerics and found himself in the middle of a war between Spain and France. His enemies finally managed to have him substituted. His reign marks the close of a century in which the viceroys had tried with varying degrees of competence and efficiency to impose order on a troubled, rebellious population, often impeded by a baronial class determined to protect its own interests. Ironically, the money needed to govern the state often meant the imposition of austere taxation and this, plus taxation for enterprises and events which brought no advantage at all to the city, e.g. enforced donations to the crowning of the emperor and several Spanish royal weddings, made the Viceroyalty continually unpopular and caused ill-feeling even against those who worked for the improvement of the realm.